The most awaited moment is finally here. The prestigious beauty pageant of the year was concluded with the crowning of Roshmitha Harimurthy as the winner of Yamaha Fascino Miss Diva 2016 at the Dome, NSCI SVP Stadium in Mumbai. She will represent India at the Miss Universe pageant this year. The night came to a stand-still when the winner’s name was announced marking an end to this beautiful journey of 16 gorgeous divas. 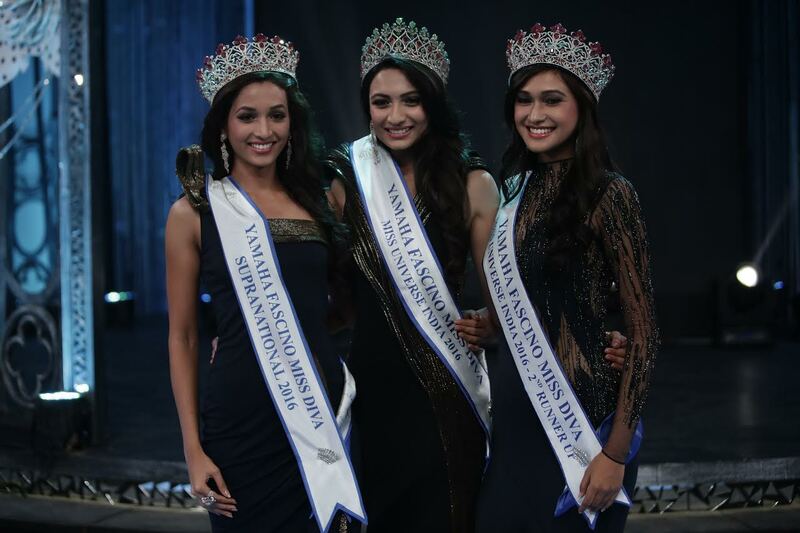 The other winners for the night include Srinidhi Shetty (Yamaha Fascino Miss Diva Supranational 2016) and Aradhana Buragohain (Yamaha Fascino Miss Diva 2nd runner up 2016). The winners were announced amidst a lot of drama and suspense by the judges panel that included Miss Universe and Actress Lara Dutta, Model turned Actor Arjun Rampal, Actor Abhay Deol and Fashion Designer Gaurav Gupta. The finale night was a visual treat which saw sizzling performances by Parineeti Chopra and Lauren Gottlieb. The two actresses’ spectacular act left the audiences asking for more. Stand-up comedian and actor Vir Das lightened the mood as the anchor for the night and his punches and witty one-liners kept the mood light as the anxious contestants waited for the final crowning moment. The contestants who had been vying for the coveted title underwent rigorous training, workshops under the mentorship and guidance of Bollywood Actor and Former Miss Universe, Lara Dutta. The viewer’s got a chance to be a part of this exciting journey through a 6 part series which was aired on India’s premiere English GEC- Colors Infinity. There were a lot of celebrities including Dino Morea, Neha Dhupia, Shantanu and Nikhil, Sophie Choudry, Shibani Dandekar, etc who came on the episodes and along with Lara Dutta gave the girls individual advice and tips on their body language, ramp walk, personality etc. The finale episode was aired on Sunday, 11th September, 7 pm exclusively on Colors Infinity. The beauties were selected from city auditions that happened in Lucknow, Indore, Ahmedabad, Kolkata, Chandigarh, Pune, Hyderabad and Delhi and culminated with the final round of auditions that happened in Mumbai. Yamaha Fascino has partnered with the pageant as the title sponsor as it reflects the spirit of freedom and the desire to go beyond conventional boundaries. The brand aims to fascinate the youth by fulfilling their life with products and services. Adding to the excitement, they will also cast one of the lucky finalists to feature in a brand new Yamaha Fascino TV commercial! The pageant has been styled by Splash Fashions – a brand that celebrates fashion in its true sense with the philosophy of ‘Love Fashion’. ”. Yamaha Fascino Miss Diva 2016 is a 6 part reality tele-series which will be aired on Colors Infinity, India’s Premier English Entertainment channel. Ishita Sachdeva– Yamaha Fascino Miss Fascinating, Natasha Bharadwaj– Yamaha Fascino Miss Talented, Ishita Sachdeva– Splash Miss Style Diva, Ishita Sachdeva– Nazraana Miss Shining Star,Muskaan Deria– Dazller Eterna Best Makeover, Roshmitha Harimurthy– Kodak Lens Miss Spectacular Eyes, Roshmitha Harimurthy– Ulric de Varens Miss Refreshing Diva, Srinidhi Shetty– Miss Beautiful Smile , Srinidhi Shetty– Miss Photogenic and Roshmitha Harimurthy– Miss Rampwalk, Srinidhi Shetty– Miss Body Beautiful (based on task in episode), Heena Bhalla – Gio Collection Miss Lifestyle and Miss Congeniality – Ayushi Arora. Watch the repeat telecast of the finale and crowning moment of the new Yamaha Fascino Miss Diva as she takes on the Universe exclusively on Colors Infinity Thursday, 15th September 2pm!